In this picture, this lady is practicing bathing a baby with a baby doll. Sapporo city holds classes for new parents-to-be. Midwife or Public Health Nurse gives you talks on for how to spend your pregnancy, how to raise children, as well as practical experience. Health Center offers various services for expectant mothers and parents and children. For further information, contact Health Center as the date may change. “A Baby is on the Way! ”(The English version of the”Wagaya ni Akachan ga Yattekuru” わが家に赤ちゃんがやってくる！)has been uploaded on the English Website of the Sapporo International Plaza. 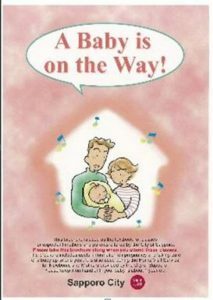 This brochure is used as the textbook for classes for expectant mothers and parents offered by the City of Sapporo. Please take this brochure along when you attend these classes. 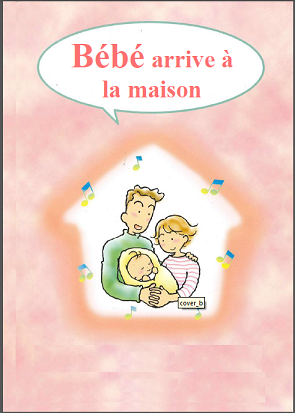 The brochure includes useful information on pregnancy and taking care of a baby up to one year. It is also used during the Home Visit Service for Newborns and Mothers provided by the City of Sapporo. Please keep it on hand until your baby is about 1 year old. Congratulations on your pregnancy. Despite the joy and excitement of bringing a new life into the world, you probably have various concerns. If you hold your unborn baby’s life dear, and you and your husband cooperate as much as possible, you will be able to enjoy pregnancy, childbirth and parenting. Parenting is not just about raising a child; parents also grow and their lives are enhanced. This textbook is intended to help expectant mothers enjoy their pregnancy and take care of their baby with peace of mind. Unfortunately, the updated 2014 version is not available in French. You can, however, get the 2011 (April) version here : “Textbook in French”.